Do you know the difference between a labyrinth and a maze? According to our visiting speaker Jeff Saward on Saturday 28th February, a maze is for fun, with multiple pathways leading to the goal, with dead ends and blind alleys. They are relatively modern, having first come into vogue in medieval times, just 500 or 600 years ago. Hampton Court probably has the best example, dating from 1690. Whereas labyrinths have been around for at least 4,000 years, possibly more, and have a single pathway to the centre. There are no false starts or decisions to make. To produce your own labyrinth, you start with a cross (this was way before Christianity) and four dots, and then join them up with loops until you have seven concentric circles. 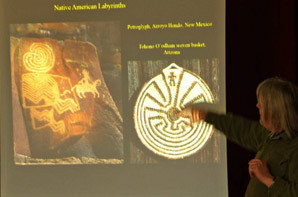 Our speaker showed us a dazzling selection of labyrinths he had visited. They can be difficult to date accurately, but the earliest is thought to be in Sardinia, c. 2500 BC. Another in Greece is dated 1200 BC. Others have been found in Goa, India, probably Neolithic; petroglyphs in Arizona and New Mexico show the American Indians were using them long before any European contact. Labyrinths aren’t confined to drawings on rock-faces and walls, however. They can be flat on the ground, marked out by large stones or turf. Designs abound in Scandinavia, Iceland and northern Russia. Cyprus has examples, as do Austria, North Africa, Algeria, Ireland and Turkey. It was remarkable that they have spread so far and wide simply by word of mouth and passing on the design. There was no DIY manual back then. The Romans loved labyrinths too, and they were in Europe until AD 400. Many of theirs were mathematically accurate, necessary when building mosaics, and you can probably find one on a floor near you. The new religion - Christianity - took to them with great enthusiasm. Despite the pagan origins of labyrinths, that cross in the centre must have been irresistible. They were perceived as representing the inner journey or a pilgrimage. 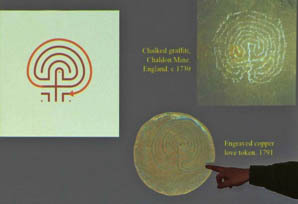 The famous Mappa Mundi map dated AD 1280 in Hereford Cathedral includes a labyrinth. Probably the most famous labyrinth of all is the one in Chartres Cathedral in France. Dated AD 1220, copies were made on canvas and sent around the world. We have a rolled-out version in Gloucester Cathedral every August, which we can walk and follow the path. After the Mediaeval dark ages, the sixteenth-century Renaissance brought a revival in just about everything, including labyrinths. Ghent town hall in Belgium has one dated 1533 in their Court House, probably representing the long and tortuous path to justice. The Renaissance also brought us printing, and therefore instruction manuals on how to build your own labyrinth. Closer to home is the Labyrinth at Troytown in Slimbridge, dowsed by Peter Golding, founder and now President of Slimbridge Dowsing Group. This one is on private land, and after years of neglect, there’s not much to see, but it is simple to dowse and mark it out with flags. Labyrinths the world over are often located in areas with reference to Troy. Today, labyrinths are enjoying yet another revival in popularity, and many people are building their own. They don’t have to be big. There’s one in Manhattan, New York, in a church commissioned by the Rockefeller family in 1928. You’ll find one in Abingdon dated 2008; Iona put them on church door handles in 2001. Glastonbury has one, of course; Kent University in Canterbury too, and there are plenty in private homes and gardens. Yet, having furnished us with so much fascinating historical information, our speaker was loath to admit labyrinths had any purpose or significance. Questions from members at the end clearly illustrated that they thought otherwise. Initially dowsers believed they were finding water of the highest purity - holy water? - at the centre of a labyrinth, and there was some debate as to whether ancient labyrinths were built over an existing water source, or whether the energy of the pathway caused water to accumulate below, like a blind spring. However, further research by Peter Golding suggests this is not water after all. He believes that the concentric rings form a ‘Freznel Lens’ (as seen in lighthouses), which focusses radiated energy to a point some 30 feet below the surface. The width of the rings determines the frequency at which they resonate, similar to that of water. Peter says it is most unlikely that you could find water in the desert just by constructing a labyrinth to order. How could anything so ancient, that has survived for so long, that has been so prolific, spread so far, and enjoyed so many surges in popularity, NOT have a purpose or be of major significance? Something that has captured man’s imagination for over 4,000 years, and is more prolific today than it has ever been as people become less religious and more spiritual, must have had a reason for being, a reason for surviving and a reason for spreading more quickly than Ebola. Despite our speaker’s dismissiveness, our dowsers believe the labyrinth represents the inner journey, possibly in the form of a meditation, as you concentrate on following the path, excluding other thoughts and distractions. Following the path, either on foot or on a small reproduction with your finger, is certainly calming. We are seeing labyrinths today in hospitals and hospices, schools, colleges and universities. Anyone who has walked a labyrinth will tell you there is some sort of uplifting feeling at the centre. Perhaps it is due to energy resonating at ‘water frequency’ with our bodies, which are 60 per cent water too. Whether it is a transformational experience, or simply a short-lived inner peace, labyrinths undoubtedly had a purpose.